This recipe has become a staple vegetarian dish in the Daughtrey-Kee household. All the nutrients from the veggies and the protein & carbs from the quinoa make it a perfect night-before-a-long-run meal. If you haven’t tried poblano chiles before, don’t worry. They’re not spicy. Combine water & quinoa in a medium saucepan; bring to a boil. Cover, reduce heat, and simmer 13 minutes or until liquid is absorbed. Set aside. Spray a large nonstick skillet with cooking spray; place over medium-high heat until hot. Add bells peppers, onion, jalapeño, and garlic; sauté 2 minutes. Add pumpkin seed kernels; sauté 2 minutes. Remove from heat; stir in quinoa, green onions, cilantro, soy sauce, and lime juice. 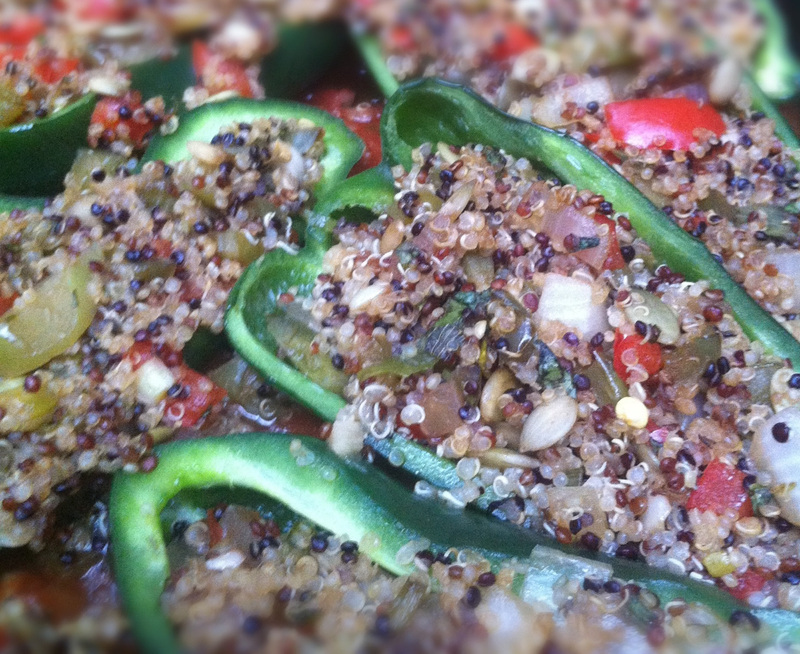 Spoon 1/3 cup quinoa mixture into each chile half. Pour tomato juice (or salsa) into a 13×9-inch baking dish; place stuffed chiles in dish. Cover and bake at 350° for 20 minutes. Sprinkle cheese over chiles; bake, uncovered, an additional 10 minutes or until cheese melts and chiles are thoroughly heated. Spoon tomato juice (salsa) over chiles. This dish works great even without the cheese, so if you want to cut the fat a little, leave it off. The original recipe came from Cooking Light Magazine.